The International Gallery of Contemporary Art presents its annual Member Artist Exhibition this month. More than 50 pieces by the gallery's member artists are on display in a range of styles, from wild and out-of-the-frame to controlled and formal. Among the artists with work on display are Scott McDonald, Jannah Sexton Atkins and Cody Swanson. 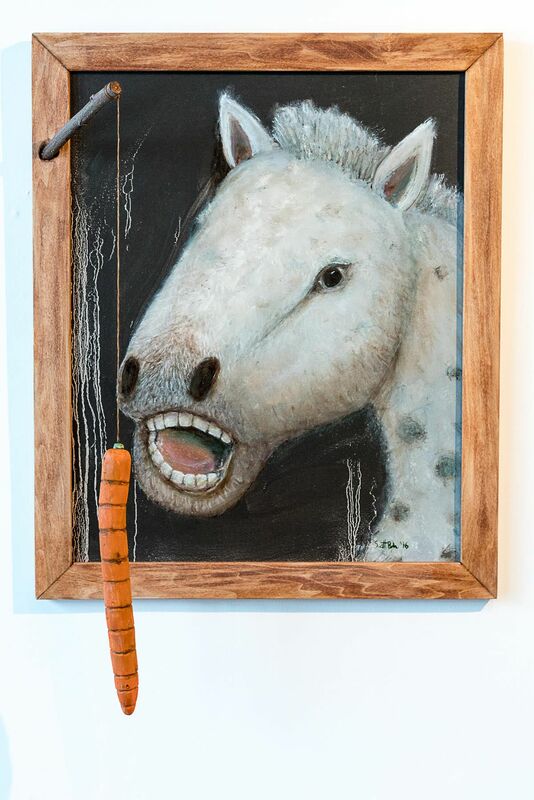 Scott Pugh's amusing oil with a wooden carrot and string, "How I Added Horse Wrangling to My Resume," particularly caught my attention at the First Friday opening. So did a fascinating, dark, geometric abstract by Rosemary Redmond, "Alaska Gothic." Stop by 427 D St. and see what you like, but don't delay. The show ends Saturday, Jan. 28. We don't think about it, but Russia's sale of Alaska 150 years ago may be the reason that Tchaikovsky's popular "Marche Slave" ("Slavonic March") exists. The tsar sold the colony, they say, to raise money to pay for his upcoming war with Turkey. A war required soldiers, soldiers needed a good march and Tchaikovsky supplied it. Hear his "Marche Slave" and "1812 Overture," along with the theme from the "Superman" movie and more, in a one-hour concert at 2 p.m. Saturday, Jan. 21, in the West High School auditorium. The Anchorage Symphony will be joined by the Society of Strings and the Anchorage Community Band for this short, fun and free family concert. Have kids? Love airplanes? The Alaska Aviation Museum invites everyone to stop by between noon and 4 p.m. on the third Saturday of every month through May for Free Aviation Adventure Days. BP is picking up the cost of admission so that you and the family can check out the treasures of Alaska's aviation history and take part in aviation-themed activities. The next free day is Saturday, Jan. 21. If you can't make it, plan for Feb. 18, March 18, April 15 or May 20.